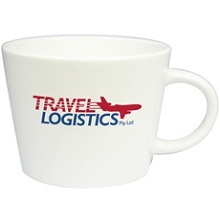 Stand tall and proud on your customer's desks - Our Jumbo Personalised Mugs with Logo Print are perfect just for this! With a height of 76mm and circumference of 100mm, this large promotional mug offers a 1 print logo with a large print diameter to print over. The bigger the better, and with a batch of Jumbo Personalised Mugs with Logo Print - you really can't fail to gain brand awareness on a huge scale. Increasing your profit margins is a certainty. Get your name out and about with a batch of Jumbo Personalised Mugs with Logo Print and be seen! For a FREE QUOTE, please fill in the form regarding our Jumbo Personalised Mugs with Logo Print and we'll be able to help you.